ICG stands for the Internet Cat Gestapo. We started this little club, well, heck it isn't even a club, just a joke between the members that are referred to in the following post found on a newsgroup. October 29, 1998...Posted by Cindy F.
"It is hopeless to try get the die-hard anti-clawing people to even consider relearning what they have had drilled into their small heads and that is why I want no part in their "discussion" boards. There is nothing to discuss...just attacking, name-calling, alot of bitchiness! a few months back, I had been searching around the Net for different cat health related sites and , unfortunately, wandered on to the site/message board of one "lisaviolet". (I did see her name posted to the board you & I found each other on and THAT is why I will not post any message to the board and choose to respond directly to email address of normal sounding persons! This lisavoilet is a cat nazi. All I did was respond to a person asking what declawing was like and this lisaviolet and three or four others went to town calling me all kinds of things, posting to each other referring to me a s a moron, idiot, etc. They actually challenged me to post my email address so they could "educate me". I posted once more, telling them I had no intention of ever visiting the message board again since all it attracted was a few narrow-minded people who had to resort to name calling since they did not have a command of the English language...I checked that message board a few days later and they were ranting and raving because they couldn't get their claws in me. That was it for me trying to voice another opinion to the anti-declawing nazis! Now, come on. Me? Nazi? Because I try to save the claws of cats by trying to educate people? I've got to be honest with you here. I really don't care what people call me, because I'm pretty secure with who I am and my values. I laugh when people I know call me names, sometimes I even agree with them. So, I really find it funny when people I don't know start. It tells me more about them than I wish to know. Gosh, didn't they ever hear the old "sticks and stones may break my bones, but words will never hurt me" adage? Or maybe they just haven't matured enough to understand it? Still living back there in elementary school? "LOLOLOLOL!!!! Oh, my!!! She's still steaming over that, is she??!!! "I have a *private* messageboard for people to ask questions about how to train their cats or for other information about cats and claws and it specifically says "If you insist on posting about the greatness of toe amputation, expect to take some heat. Don't get upset or hurt when you are not met with open arms, but with open hostility." "I don't see how I could have made it any clearer. "Someone who keeps coming back for more (using different names, by the way), knowing how the wind blows, is either trolling for trouble, or isn't too bright. And that's just my humble opinion. I did tell her that I would start to delete her messages and that's just what I did. 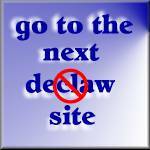 "The name of the board, like my entire declaw site is Educate!! 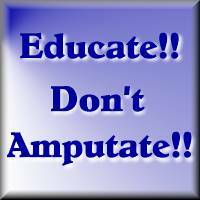 Don't Amputate!! I have an anti-declaw webring, pages written by vets, a vet tech, a place where you can add your own tips for training cats, my personal childhood experiences with clawed cats, and a lot more, and I don't call anybody anything, I just explain why I feel the way I do. Oh, and in case you were wondering who the others might be, they are Fran, Susie, Jana, Cricket, Maxine, Karin and Lilith (and, by the way, who rarely, if ever post to the newsgroups, where the above was found), all of who left their names and email addresses up for response. The troublemaker posted under the names Denise, Beth Anne and then no name at all. It was easy to find out, because the program also posts the ISPs of the posters. So much for standing up for the courage of your convictions.